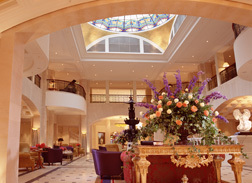 Happy 100th birthday to the Hotel Adlon Kempinski! The grande dame hotel celebrates her centenary birthday in October 2007, and she never looked lovelier. Although the formal celebration will occur on October 29, 2007, when you are going to celebrate your centenary birthday, why wait until the actual date to start celebrating? The Hotel Adlon Kempinski has been celebrating since Edward F. Nesta and I stayed at the hotel in March 2007, although probably not as a direct cause of our visit. Everyone at the hotel is so excited about the centenary celebration that the Pastry Chef has created a tempting cake for guests to participate in the early festivities by indulging in a slice, or two, (who is counting?) of the famous Hotel Adlon Kempinski cake during Afternoon Tea while sitting next to the elephant fountain with frog spigots and listening to piano music in the lobby. What I think is an absolutely brilliant idea is that the hotel will ship one of their delicious cakes presented in a specially designed gorgeous box worldwide. 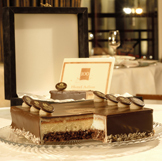 Imagine having the cake arrive to commemorate a special birthday, a memorable anniversary spent at the Hotel Adlon Kempinski, or even to send to someone special for "just because." I know that receiving one of these cakes would certainly brighten my day! To celebrate this important birthday, Head Barman Franz Höckner of the Lobby Bar, created the champagne cocktail, "Diva Jubilee Cocktail" which captures the spirit of this stunning grande dame, since every diva deserves champagne, and sipping the Diva Jubilee Cocktail had me feeling every bit of a diva myself. The hotel has an impressive historical exhibition entitled the "Adlon-Oblige - 100 Years of Hotel History" on display on the Bel Etage, from March 1, 2007 - October 31, 2007, which Edward and I found absolutely fascinating. 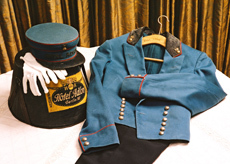 The exhibit depicts the Adlon from the beginning and includes 100 years of memorabilia including old hotel uniforms, charming bed warmers, original menus, guest books, and photographs of the many heads of state, socialites, and celebrities who selected the luxurious Hotel Adlon Kempinski as their "home away from home" when visiting Berlin. As part of the celebration, the hotel has published the Hotel Adlon Centenary Book, 100 Jahre Hotel Adlon Kempinski Berlin, written in German and English that documents and commemorates the history of the hotel with 192 pages of photographs and humorous and interesting anecdotes. I was completely captivated reading the book, which took me on a 100-year journey, where I felt like I was on a magic carpet ride reading about the wedding of the German Emperor's only daughter, Princess Viktoria Luise, to Ernst August of Cumberland, Duke of Brunswick-Lüneburg, about the Adlon family, and the Hollywood celebrities that visited in the 1920s, the heads of state, and the evolution of the legendary hotel throughout the years. This excerpt from the book clearly defines the mystique of the hotel since the very beginning, "When are hotels born? In the case of the Adlon, it was 11 am, 24th of October, 1907. The Emperor and Empress strode through the grand entrance of this new building, followed by the princess, princes and the entire royal household. It was not simply the opening of a hotel, it was more like an act of state." With such a grand beginning, the hotel was destined to become a legendary star. Europe's largest department store, KaDeWe, also celebrates its centenary birthday this year and has joined in their celebration efforts with the hotel to offer guests a unique shopping experience. Whenever I am in Berlin, I always make a stop to this shopping paradise, and with the added incentive of being driven in an "old-timer" to KaDeWe, and a personal shopper, if you love to shop, this is definitely an enticement. We had a romantic dinner in their restaurant, Lorenz Adlon (one-star Michelin, 17 points GaultMillau and five cutlery), where we had a spectacular view of the moonlit Brandenburg Gate as a backdrop for Chef de Cuisine Thomas Neeser's exquisite French haute cuisine. A few of the tempting selections we dined on included Dialogue of Sturgeon and Red Beets with Imperial Caviar; Pan Seared Norway Lobster with Citrus Marmalade and Sautéed Romaine Lettuce; and Organic Fed Beef Tenderloin with Salsify, Savoy Cabbage, and Sauce Périgordine. Chef Thomas Neeser graciously shares his recipes for a three-course menu, as does Executive Chef Fabrice Lasnon in the Chefs' Recipes section. Located on the prestigious Unter den Linden, the 385-room and 80 suite hotel features lavish appointments in all of the guestrooms. 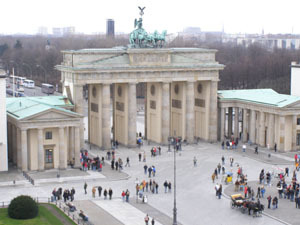 We stayed in the Pariser Platz Suite with stunning views of the Brandenburg Gate where we felt like we were a part of history in the making as we looked out our windows framed with floor to ceiling champagne and gold fabric. 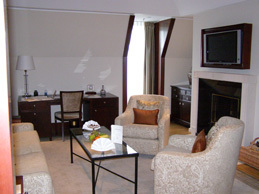 This spacious suite felt like home the minute we entered the foyer. Thoughtful details in the foyer included large coat closets with umbrellas, a console table with mirror and chair, and a black marble guest powder room. Entering the suite living room with wood floors and patterned carpet in beige and mushroom hues, and dramatic tray ceiling, the pièce-de-résistance was a wood-burning fireplace with a wicker basket filled with kindling placed beside it, setting the stage for an evening of romance and inviting us to sit beside the fire in the comfortable arm chairs flanking the fireplace, or to curl up on the beige-on-beige paisley print brocade sofa accessorized with comfortable paisley, burnt sienna silk, and café au lait embroidered pillows, while drinking glasses of champagne and nibbling the exotic mix of fresh fruit and chocolates on the silver tray on the rectangular glass and metal coffee table. Parrot tulips with curly willow in a frosted glass vase on the black metal and glass console table heralded the arrival of spring, and ginger jars on tables flanking the fireplace added a homey appeal. Original black and white photographs in gold frames captured the beauty of Berlin, while the Philips plasma television hung over the fireplace with CD and DVD features, helped keep us current on local and world news by merely pressing the button labeled CNN, etc. on the state of the art remote control, which immediately caught Edward's attention. A large executive desk placed along one wall with a comfortable chair upholstered in taupe suede fabric, provided a lovely work area, while a Waterford clock on the desk kept us on time for our appointments. 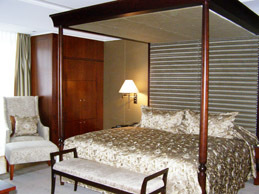 The airy bedroom was stunning with a king bed lavishly draped with café au lait embroidered silk, with an elegant gold silk canopy, a champagne and taupe crushed velvet headboard, and a mushroom crushed velvet and wood bench placed at the end of the bed. A floor lamp and a wingback chair with an ottoman upholstered in beige-on-beige paisley fabric and accessorized with a burnt sienna decorative pillow was thoughtfully placed near the window framed with floor to ceiling champagne and gold fabric overlooking the Brandenburg Gate. Nightstands on either side of the bed provided the utmost in state of the art technology and comfort, where from a touch of a button on the remotes placed discretely inside the drawers, we could control the temperature, lighting, television, and more. Other bedroom amenities included a Philips plasma television with CD and DVD features, a large bureau, and a votive candle to add a little romance, while magazines, a safe, and mini bar were discretely hidden behind wood doors. The ample walk-in closet and dressing room located off the bedroom featured a vanity table with mirror and enough room if we planned on making the suite our home instead of merely staying for a few days. The black marble bathroom was a dream, with separate his and hers vanities with shaving/make-up mirrors, robes, hairdryers discretely placed in the vanity drawers, enclosed toilet, a walk-in shower with a bench and rain showerhead, a deep soaking tub where an assortment of Moulton Brown amenities and sensuous bath salts and oils with aromas of rose, sandalwood, or peach, beckoned invitingly. I could not resist and pampered myself in a long, luxuriant soak in the heady aroma of rose after a day exploring the city of Berlin. Each morning we began our day in the attractive Restaurant Quarré with their opulent breakfast buffet, and we also indulged in luxurious SPA treatments, including a decadent Hot Chocolate massage in the 800-square meter Adlon SPA, which features an 11-meter pool. As the Hotel Adlon Kempinski BMW limousine whisked us away to the airport, my imagination whirled while envisioning the birthday celebrations yet to come with Managing Director Stephan Interthal leading the festivities and Executive Chef Fabrice Lasnon's elaborate menu for the gala dinner. Happy Birthday Hotel Adlon Kempinski! I wish you much continued success as you begin your next 100 years! 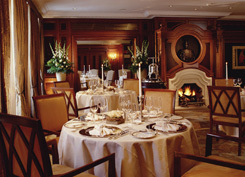 Read about the Hotel Adlon Kempinski and the Lorenz Adlon in the Restaurants, Chefs' Recipes, and Spas sections.